I. Kate et moi même avons noté une possible similitude (?) entre le dessin floral de la robe de Tempérance et les rangées successives de "Stemmas florales" (?) sous le Charioter. II. A propos de deux "cassones " datés l'un de 1466 et l autre de 1442 - portant l emblème des Medicis en possible corrélation iconographique avec le Chariot du TdChVI. Did i forget somthing or someone? These elments were not included on the "Update on a historical research" because they remain under discussion and no consensus has yet been found. 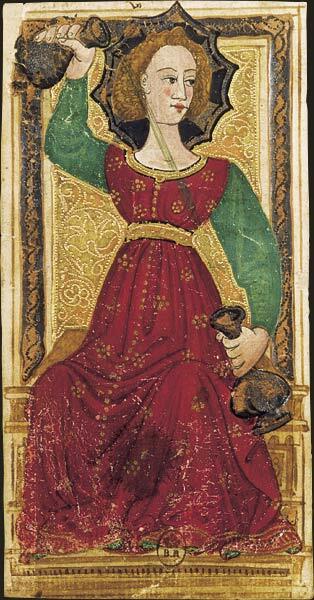 In the caption to the two "Charles VI" cards shown in Thierry Depaulis's 2013 [i\Le Tarot Révélée[/i], p. 21, the deck is dated as "vers 1460" ("around 1460"). No justification is given. Maybe Ross who has recently published with him an e book on Lulu.com could help here? Maybe directly asking : why? I don't recall having discussed the dating with Thierry, at least in any substantial way. So I don't know his reasoning. We discussed the provenance a lot, starting in 2007, when we moved to agreement that Charles VI, Catania, and the Rothschild cards were Florentine. 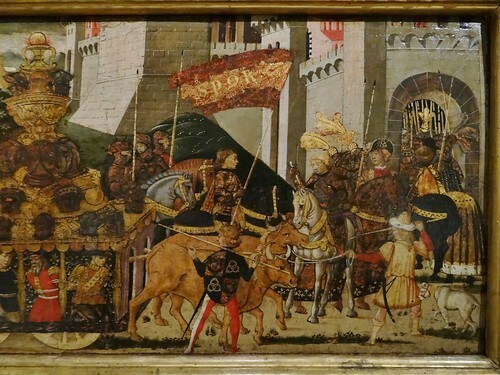 Thus the old "Ferrara, late 15th century", or "circa 1480" were no longer tenable. It could be that he finds 1460 a sufficiently conservative date, neither too early nor too late. Thanks Ross for your answer. Not far from Depaulis suggestion : "around 1460"
“As Michael Dummett has pointed out, the Charles VI pack 'differs from the Bolognese order in that the virtues are ranked below the Chariot' (footnote: Il Mondo e l’Angelo, p. 228, my translation), a feature which seems to be a Florentine hallmark. We have seen that the Strambotti d'ogni sorte & sonetti alla bergamasca collection was very probably printed in Rome, a city which was highly dependent on Florence for its playing and tarot cards. We may add that the anonymous Strambotti de triumphi is set in the Tuscan form (abababcc) (Footnote: A strambotto can follow one of three kinds of rime set: Tuscan (abababcc), Sicilian (abababab), or Romagnolo (ababccdd)). 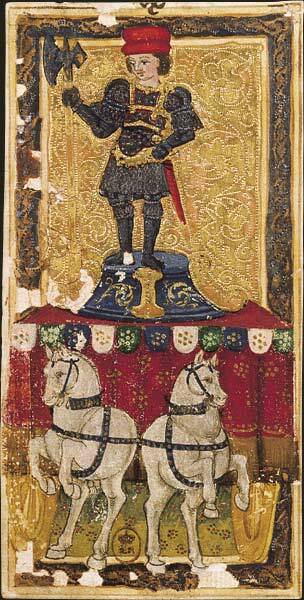 (2) Bibliography: Thierry Depaulis, “"Early Italian Lists of Tarot Trumps", The Playing Card, vol. 36 no. 1 (July-Sept. 2007), pp. 39-50, on pp. 45-46. However Depaulis in 2007, following a suggestion by Ross Caldwell, reads the number on the TdChVI Chariot card as “x”, i.e. 10, rather than Depaulis’s earlier “ix” and Dummett's “viiij”, i.e. 9. Given that the numbers were added considerably after the cards were made, probably after 1500, a conformity to Florentine usage does not show that the TdChVI is Florentine, but only that the numbers were probably added by someone who played the game in the Florentine manner. Correction added Sept. 6, 2018 The last sentence above - "Given that the numbers were added considerably after the cards were made, probably after 1500, a conformity to Florentine usage does not show that the TdChVI is Florentine, but only that the numbers were probably added by someone who played the game in the Florentine manner" - should be disregarded, for reasons pointed out by Ross in posts following this one. In the first place, the "given that the numbers were added considerably after the cards were made" is only a probability, not a fact, and even then the word "considerably" should be changed to "somewhat". Secondly, the rest of the sentence is misleading, in that it might suggest that I am casting into doubt the attribution of the ChVI to Florence. That was not my intention, but only to say that the numbers in themselves are not enough to show Florentine origin for the deck (this much was said by Dummett in 1993, for which see below). They are one consideration out of others, I would say now. That said, I want to add two references to the foregoing. First, Depaulis's 2007 article is online at http://www.academia.edu/30193559/Early_ ... 7_p._39-50. Second, the full passage in Dummett's 1993 book was posted in Italian with my translation at viewtopic.php?p=15160#p15160. I translated the quote from Dummett as "since the virtues are of lower rank than the Chariot...". Dummett's original wording was "in quanto le virtù sono di rango più basso del Carro". Both are substantially the same as Depaulis's "in that the virtues are ranked below the Chariot". "Given that the numbers were added considerably after the cards were made, probably after 1500, "
I'm out of the loop on this. Until now, I believed only that the numbers were probably added after the cards were made, but that there is really no way to tell. What new discoveries did I miss? "a conformity to Florentine usage does not show that the TdChVI is Florentine, but only that the numbers were probably added by someone who played the game in the Florentine manner." The iconography of the Charles VI, Catania and Rothschild sets (per Fiorini, Depaulis, Caldwell) gives them to Florence, and the numbering of the first two is consistent with that, so I see no reason not to think that the cards were both made and numbered in Florence. What is gained by assuming otherwise? I stand corrected. Thanks for catching this. I should have said, "Given that the numbers appear to have been added..."
And I did not mean to imply that this gives any reason for thinking that the cards weren't Florentine. It's just that the numbers by themselves don't show that they are Florentine. The iconography is another issue. I will have to think about how to rewrite this. Good to know. I hate to miss something, and I can be out of touch these days. But I thought you were with the consensus that Catania, Charles VI, Rothschild were Florentine. I thought we settled it years ago. Do you doubt it? In Rothschild the Emperor's florin was the lightning bolt for Thierry and Cristina. For me it was not a sudden realization, just a deduction from comparing Charles VI to BAR and Rosenwald, back in 2006. Later I learned of what the other two were working independently on. Given the uncertainty of Rosenwald's provenance and date, my earlier methodology may not have been sound, but even if it were a happy accident, it led in the right direction. 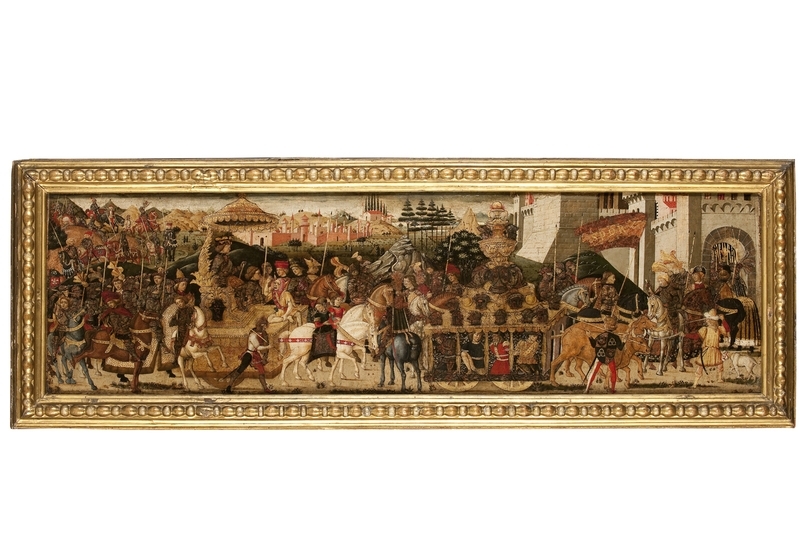 Finally, the three sets share identical borders, completely different from the other luxury sets of Este and Visconti/Sforza, which suggests the same workshop. Besides other stylistic similarities. So if one set is Florentine, they all are.